A scarce and richly detailed double hemisphere world map that was probably based on an earlier work by Cornelis Dankerts. Rudolph Wetstein and Jacob Wetstein were active publishers in Amsterdam from 1700 to 1730. The maps were printed by William Smith. This map has two small inset polar hemisphere maps and astronomical diagrams. The information about Australia, Tasmania and New Zealand is based on Tasman's discoveries in 1642-44 with the unexplored coastal areas left blank. California is depicted as an island. A common theory at the time was the land mass 'Terre Esonis' that stretched between eastern Asia and North America. Information is presented on the orbit of planets according to the Ptolemaic theory that the earth was at the center of the solar system. There is a Ptolemaic armillary sphere based upon this same concept, a Ptolemaic diagram of the Sun's position in the sky at varying degrees of latitude, and a diagram showing the relationship between the Sun, Moon, and Earth in a solar and lunar eclipse. Keys are provided that present information as to the lines of latitude and longitude of the maps. 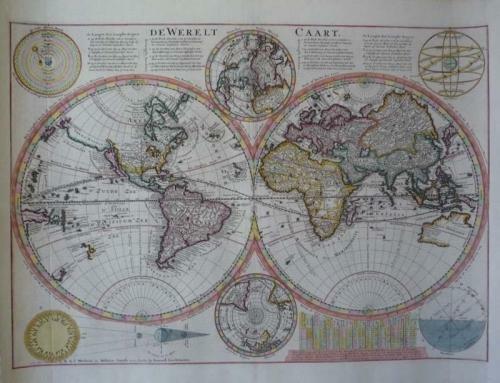 The map is in very good condition with a strong engraving on clean paper. The side margins have been extended to facilitate framing. This has been professionally done and is virtually invisible. Seldom seen on the market. Ref: Tooley, R.V. Maps and Map-Makers. 4th Ed. p. 122.